In medium bowl, combine all ingredients. Mix well using an electric mixer. Serve immediately with fruit, cubed angel food cake, cubed pound cake, cookies and/or crackers. When I was growing up my mom always had a can of Hersey's Chocolate Syrup in the refrigerator. My sister and I put that chocolate sauce on almost everything. We put it in milk, on ice cream, poured it over popcorn, and I am sure some other ways that would make you go yuck! Have you ever started to make a recipe only to get halfway through it and realize you are missing an ingredient? That's happened to me when we had the youth group at our church coming to our house to watch a movie. Teenagers are always hungry, I had a lot of fruit in the refrigerator that I needed to use up, so I planned to make my Pineapple Fruit Dip. When I realized I didn't have the pineapple needed to make the dip, and I didn't have time to go to the store, I began to look around my kitchen for a substitute. Like mother, like daughter, I opened my refrigerator and spotted the chocolate syrup. The chocolate was a perfect substitution. Everyone loved it! Even my husband, who is not a big chocolate fan. Since that day I have served this recipe as an appetizer and as a dessert. The chocolate flavor is not overpowering, just light and creamy. I love fresh fruit and vegetables. Knowing how and where produce should be stored, not only extends the life of the fruit and vegetables but helps me get the most flavor out of them. All of these should be stored in a cool, dry place at room temperature, not in direct sunlight. Both pineapples and apples can be stored in the refrigerator or at room temperature. My husband likes pulling a crisp, cool apple out of the refrigerator on a hot summer afternoon. He says it reminds him of pulling them right off the tree on the way to school when he was growing up back in Iowa Since most of the sugar in a pineapple is concentrated in the bottom of the fruit I like to store them upside down to allow the sweetness to spread. Store berries in the refrigerator and wash just before you eat them. Treat asparagus and herbs the same way. Wash asparagus and herbs. Dry them well. Cut the ends off the asparagus and herbs. Place stem side down, in a glass of water. Wrap tops in a paper towel. If you don't want to take the time to do all the prep work on the asparagus, just wrap the stems in a damp paper towel until your ready to prepare. I don't have room in my refrigerator to store herbs in glasses of water. I wash and dry my herbs, then wrap them in a paper towel and place them in plastic bags. Always store meat and fruit and vegetables separate. The crisper drawer is the best place to store produce. The moisture produced in the drawer, will help to keep the produce fresher longer. These are just a few of the tips I use to make the most of my fruits and vegetables. I would love to hear your tips on storing produce. Preheat oven to 350 degrees. In 4 quart casserole dish, combine potatoes, peas, and soup. Mix well. Arrange pork chops on top. Salt and pepper to taste. Bake 1 hour. Makes 4 servings. I like to lightly brown the pork chops before they go into the oven. You don't have to do this step. 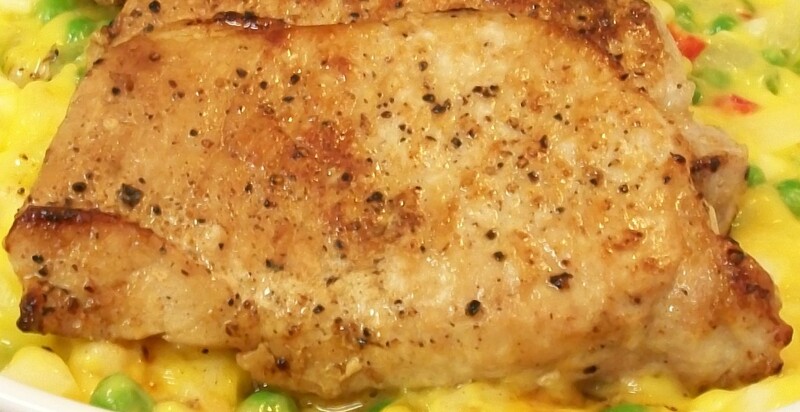 I just like the color browning the pork chops gives to the dish. I sponsor quick and easy cooking contests at state and county fairs. I love testing all of the unique recipes people enter. This recipe was an entry in the "Quick & Easy Casserole" contest. 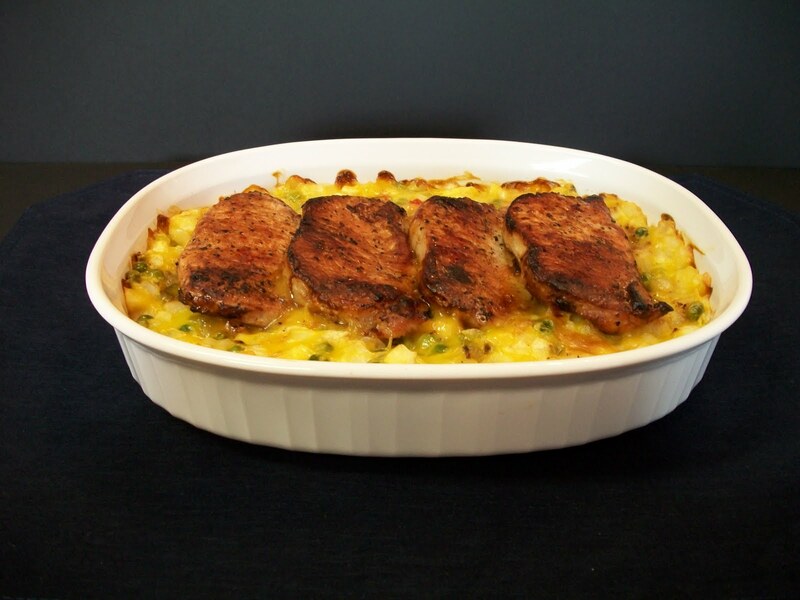 You don't often see pork chops used in casseroles, so I thought you might like to take a look at this hearty one dish meal. Did you know, a serving size portion of pork tenderloin is as lean as a skinless chicken breast? When looking for the leanest cut of pork, choose a cut that has "loin" on the label. Pork is often over cooked. 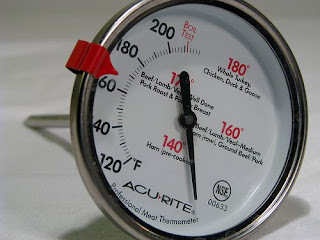 Use a meat thermometer to test the temperature of the pork while it is cooking. The thermometer should be inserted into the thickest part of the pork. If the cut of pork you are cooking has a bone, make sure the thermometer is not touching it. According to the Pork Council, you should cook the pork until the temperature reaches 160 degrees and is a little pink on the inside. When I was at the Iowa State Fair last year, I had an opportunity to interact with representatives of the Pork Council. Anytime I get a chance to pick the brains of those who are experts in their field I do it. In the course of our conversation, they communicated the fact that pork is really at it's prime when it's slightly pink in the middle. I questioned them about the safety of eating pork that is pink in the middle. They said, "Unlike chicken, it was perfectly safe to eat pork that way." The key again is the 160 degree cooking temperature of the pork. Since they are the experts, (like mom) I feel confident in passing this tip on to you. I grew up in the Midwest. Maybe it was just my family, but we ate a lot of pork. I've had pork cooked almost every way possible. My mom liked to swap pork for chicken to change a recipe up. By doing that you can change an old standby recipe into something new and exciting! On Friday I will be posting my simple and tasty Pork Chop Casserole. In slow cooker, layer potatoes in bottom. Sprinkle sausage over potatoes. In medium bowl, combine eggs, evaporated milk and 1/2 cup shredded cheddar cheese. Mix well. Pour egg mixture over sausage. Cover with lid. Cook on low 7 to 8 hours. During last 10 minutes of cooking, sprinkle remaining 1/2 cup shredded cheddar cheese over top. Cover with lid. The edges on the egg mixture become dark brown when you let it cook for 7 1/2 to 8 hours, but the eggs were light and fluffy. It doesn't effect the taste. This recipe will be featured in a future cookbook. I cook breakfast almost every Sunday for the youth group at our church. The kids love being my guinea pigs, I mean taste testers. You may be shocked to hear this but, I am occasionally late for church. On one such Sunday, when I knew I was going to be late (instead of accidentally being late), I created this recipe for the slow cooker in a effort to be a little late instead of embarrassingly late. The guinea pigs, aka kids, loved it! They left the class talking about the Slow Cooker Breakfast. After church several of their parents and other church members asked for the recipe. And now you have it too! To test if an egg is fresh, fill a bowl with water, add 2 teaspoons of salt, then add the egg in question. If it sinks, it's a good egg. If it is a floater, toss it out, it's a bad egg, and no one likes a bad egg. Which is better, white or brown eggs? My mom always said they were the same nutritionally, the only difference is in the color of the shell. I believed her, but I thought if I am going to put it on the blog I better check her facts. Once again "Mom is always right"! The color of the egg is determined by the color of the feathers on the chicken. White feathers, white egg shell. Brown or red feathers, brown egg shell. That's it! There is no difference in taste or quality. In large skillet, place one tortilla. Layer half of chicken, salsa, apple, and cheese. Place 1 tortilla on top. Cook over medium high heat until golden. Flip. Cook until golden. Remove. Cut into 4 wedges. Repeat process. Makes 4 to 8 servings. When I make this recipe I butter the outside of the tortillas. It not only adds flavor to the tortilla, it also adds a beautiful golden color. Use your contact grill (George Foreman type grill) when you prepare your quesadilla. It makes a simple quesadilla look gourmet by putting grill marks on the outside of your tortillas. And you don't have to flip your quesadilla, so the ingredients stay between the tortilla instead of falling out as you flip it over. It is the only way I made quesadillas now. I came up with this recipe when my husband, Stan, our son, Tyler, and I went to lunch at a downtown restaurant in Albuquerque. Our son loves quesadillas, so we ordered their grilled chicken quesadilla. When we bit into the quesadilla we all said "What is in this quesadilla?" To our surprise, they put a green apple in the quesadilla. I always carry a small notebook. I pulled it out and made notes on how I would make it at home. I was stumped on how to get the grill marks on the quesadilla in an easy to make way. We were halfway home before it dawned on me I could use my contact grill and get the same results. This is another recipe I made for the Christian singer Steven Curtis Chapman and his band. They loved it! 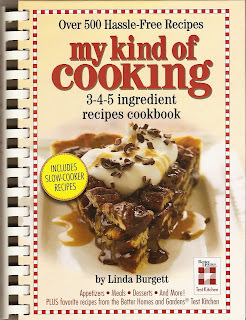 I took a copy of my cookbook to give to Steven's wife. 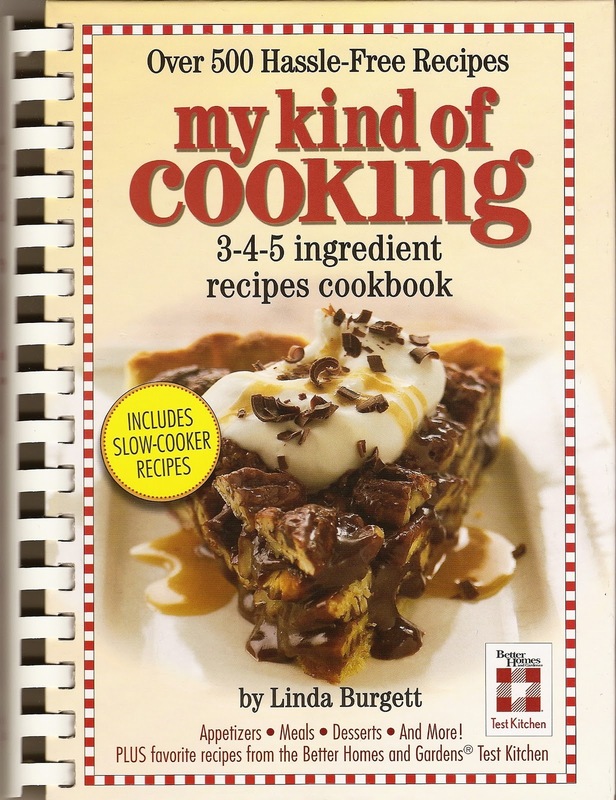 His manager came to me with the book and asked if I could point out which recipes I had made. When I did, he asked if he could make copies of the recipes. I gave him permission and the next thing I knew everyone was asking for copies. It just goes to show, you don't have to spend hours in the kitchen to make delicious food everyone will love. I love utensils that you can use more than one way. Next time you make a quesadilla, grab a pizza cutter to slice it. It works so much better than a knife. It slices cleanly and easily through the tortillas without pushing the ingredients out the sides the way it does when you use a knife. I always start in the middle and cut to the outer edge. In this photo I am slicing my Chicken Surprise Quesadilla. Check back on Friday when I post the recipe to find out what the surprise is! In large serving bowl, place 1/2 of pound cake. Spread 1/2 of pudding over pound cake. Arrange 1 sliced banana over pudding. Drizzle 1/4 cup caramel over banana. Spread whipped topping over top. Repeat process. Drizzle 1 tablespoon caramel ice cream topping over whipped topping if desired. This is a great dessert to serve at your Easter dinner. Everyone will love it! I created this recipe in the backseat of my car. No Kidding. I forgot we were invited to a friend's house for dinner. As I was walking into Walmart, I ran into my friend's husband. He said, "I'll see you in an hour". All of the sudden, I remembered we were supposed to have dinner at their house and bring the dessert. I write cookbooks so I couldn't buy a dessert. As I wandered around the store, I spotted the bananas. My husband loves bananas! What could I make with bananas? He loves banana pudding. 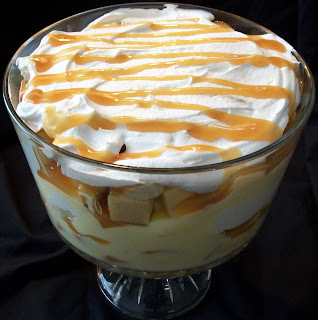 What could I do to jazz up banana pudding? Then it came to me, trifle! I will make a trifle. I grabbed all the ingredients (I used already prepared vanilla pudding cups instead of instant pudding). Went to the dish section of the store and picked up a trifle bowl. I talked the nice lady behind the deli counter into washing the bowl for me. Then after paying for everything, I went out to my car and made the dessert in the backseat. This easy to prepare desert has become not only my husband's favorite dessert, but friends ask me to make it over and over again. When the Christian singer Steven Curtis Chapman and his band came to our town for a concert, this is one of the desserts I made for them. During the break in the concert, I went to the Green Room to clean up. When I got there, I found one of the band members with a spoon, getting every drop of the Caramel Banana Trifle out of the bowl. He was embarrassed to be caught, but I was flattered that he liked the dessert so much that he was practically licking the bowl.